As mentioned in my initial post on Kyoto, we enjoy learning the history and culture of Japan. 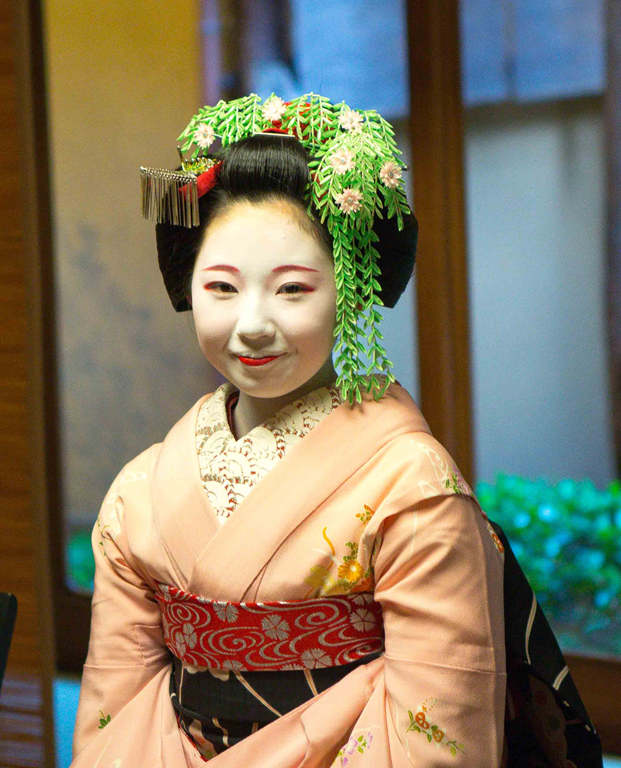 We did not know what to expect with our dining with a maiko/geisha/geiko experience. 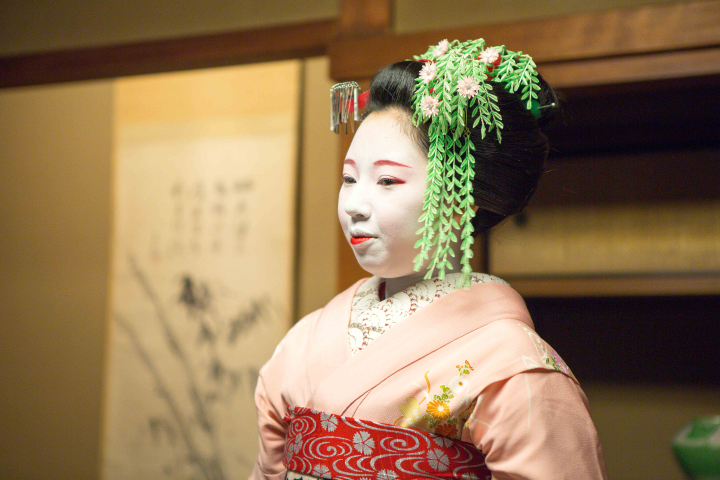 When the maiko-san originally arrived, our interpreter quickly helped us make introductions. She sat down with our family and the conversation began, a free flowing discussion of her life over 2 hours. In no particular order, a few highlights from the conversation. She is 17 and grew up in Nagoya. She chose to become a maiko after going on a school trip to Kyoto. 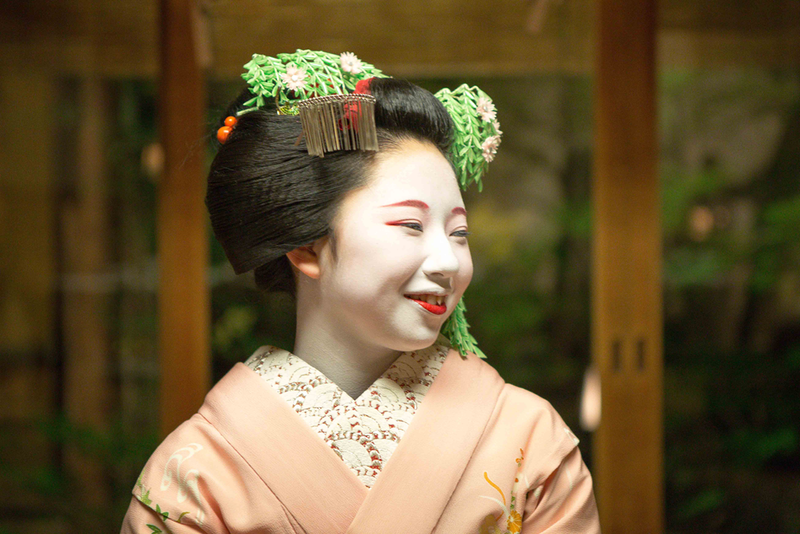 She watched a geiko perform and decided that she wanted to join the profession. Her upper lip is white as she is a maiko. When she becomes a geiko she will decorate both lips. Every month she changes her hair decorations. This month I believe it is the willow. She often entertains school groups and when asked what the funniest question she gets, she laughed and said one question always come up – does she have a boyfriend? (answer is no – not allowed to). 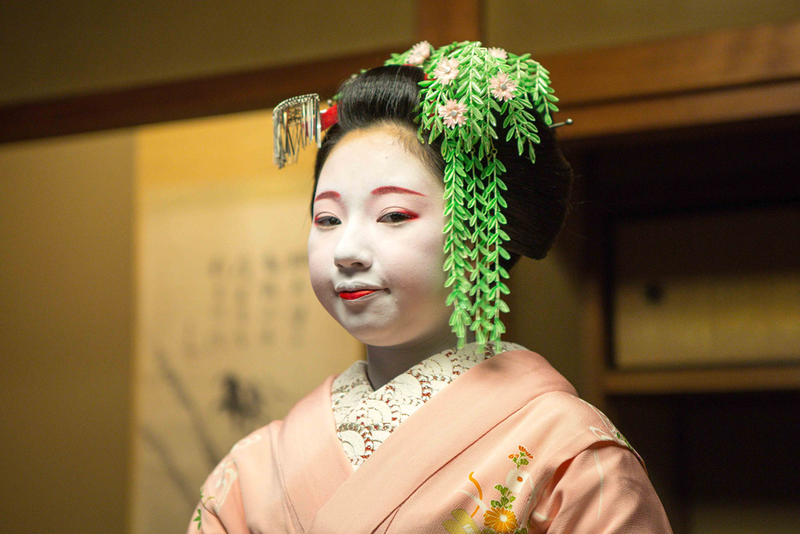 In her first year prior to becoming a maiko it was like an apprenticeship. She learned what the years ahead would be like, and whether she wanted to continue. It is not an easy life. She starts the day at 10am with training in the arts. She then dresses, doing her own make-up (it takes 40 minutes) and having assistance from a man who comes to the house daily to assist with the kimono which weighs 10kg. The sash is 7m long. She then visits 20 tea houses that her house is affiliated with, and starting at 6pm does 2 hour hosting sessions until midnight. At midnight she heads home, has a hot bath and a few hours of personal time (reading, TV, music) until she heads to bed at 3am. She is not allowed to have a cell phone. When she contracted with her mama-san to become a maiko, she made a 5-7 year commitment until she becomes a geiko at 20-22 years. The mamma-san pays for everything (training, food, clothing, lodging) and in return takes all profits from the days work. She lives with 8 other maiko. She only gets 1-2 days off a month and time at New Years to go home. When asked what do people think at home – she said that she is growing apart from her old friends. Her grandmother has never approved. If she needs money she has to ask the mamma-san. I got the impression that was not something that was done often or lightly. She enjoys listening to music on her Sony Walkman. She likes Avril Lavigne. Dinners are mostly with business men, although they are starting to see women. If it is after dinner, it often involves karaoke and evenings at bars. Tourists are always trying to take her picture. She would prefer if they asked first. She will often take the train to Tokyo for events (entertaining events, Sumo tournaments) fully dressed. To formally enter her maiko apprenticeship, she had a ceremony involving her performing for the mamma-san and an important client. Many maiko do not become geiko (50/50). They decide to go back to their homes, head back to school or get jobs. In effect, starting a different education. Will she continue on and become a geiko? She didn’t know. It is a hard life. This entry was posted in Our Asia Adventure, Photography, Travel and tagged Canon 5D Mark III, Canon EF 28-70mm f/2.8 L USM, culture, dinner with a maiko, Experiences, Geiko, geisha, Japan, Kyoto, maiko, Photography, photos, travel by michaelweening. Bookmark the permalink. 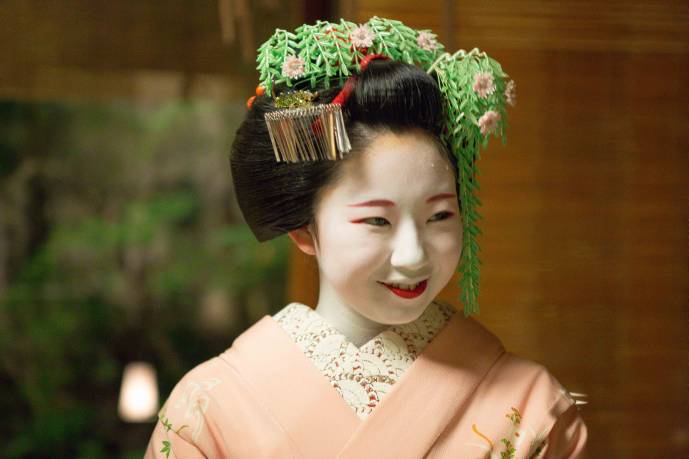 When a girl becomes a maiko she must find an one-san, an older geisha to become her mentor or “older sister”. This geiko may not necessarily be from the same okiya, but that is the most common way. 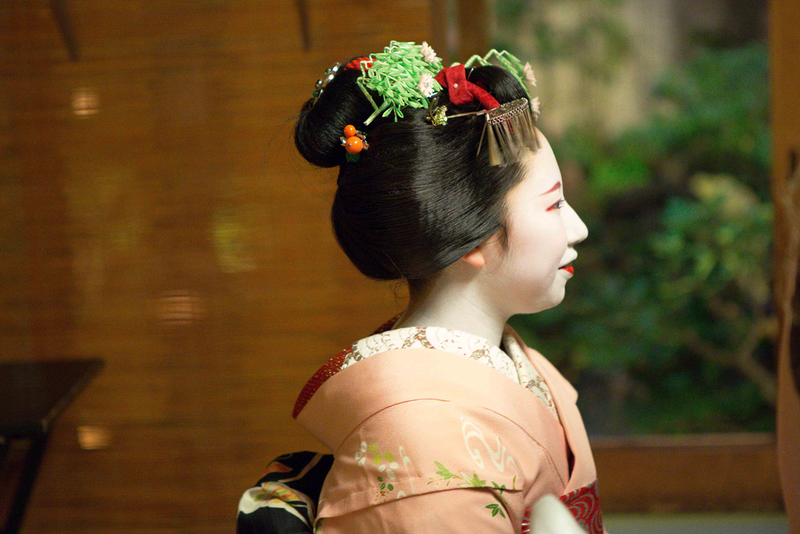 The rite of misedashi is a maiko’s debut, and much fanfair is given to the ceremony. Fans and banners bearing the caligraphy and name of the new maiko are given out to loyal patrons and other members of the hanamachi. To bind the maiko to her one-san the ritual of san san kudo is performed, usually in public at the kaburenjo and followed by a party. I’m pretty sure it goes like this. They go to the guy and ask him to approve a certain name for her, but the guy must know she must be Kiku- something or other. Because the geiko always pass down names I’m sure he is told ahead of time who the girl’s oneesan will be. her name is Toshimomo of the Komaya house 🙂 I loved your blog post. Hope there will be more! Being on my own was difficult to manage. I still needed them for my beautiful outfits and for help and advice. I still had to help out at the okiya – Mameko and mama-san could not do everything themselves – but, somewhere along the line, I managed to get my own independence, my own life. 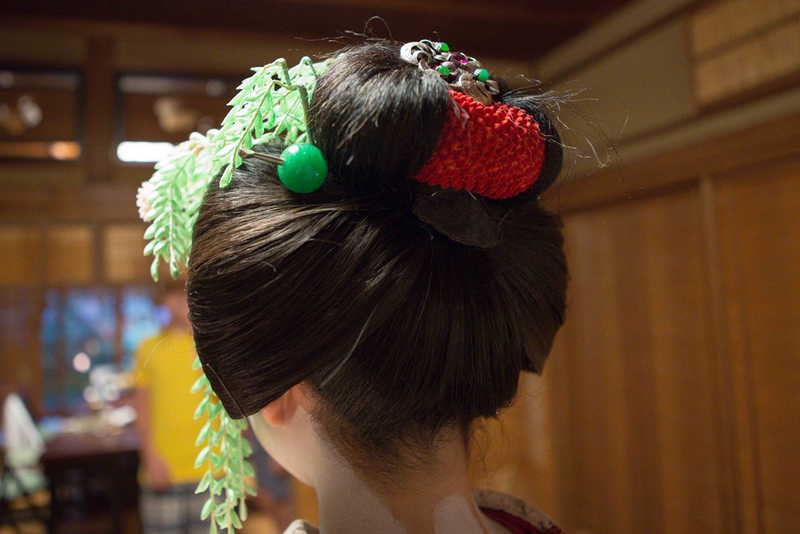 It was very unusual for a maiko to live on her own – usually only some geiko can manage this, if they were successful! But I was … different. I always had been.